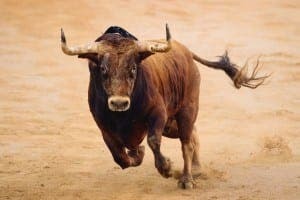 Home Other News La Cultura POLL: Would you ban bullfighting in Spain? POLL: Would you ban bullfighting in Spain? A RESOUNDING 80% of Olive Press readers would ban bullfighting in Spain, our poll has so far revealed. It comes after a nationwide study found fewer than one in five Spaniards now supports the historic tradition. 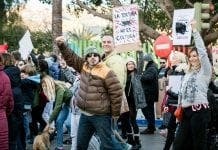 The poll by Ipsos MORI for World Animal Protection showed just 19% of Spaniards aged between 19-65 backing the custom, down from one third in 2013. The Olive Press’ own poll aimed at expats (found below) has so far produced similar results. Of the hundreds to vote, one in five said they would not ban bullfighting. World Animal Protection regional director Ruud Tombrock said: “Outdated traditions of bullfighting and other cruelty towards animals in the name of culture are no excuse for the torture that it involves. World Animal Protection recently delivered a 140,000-strong petition to the mayor of Medinaceli, in Castile and Leon, where the Toro de Fuego features bulls having fire balls attached to their horns. Bull fighting appeals to the same base instincts as public executions did during the Inquisition and the French Revolution. Well done Chas. Been to any? Thought not. It’s not even worth arguing against comments like that. I haven’t been to any public executions either, but I know I would not want to go to any irrespective of that fact. Well said, Fred. That is what the prefrontal cortex is for – to mediate instinctive reactions from the brain stem. Fifty years ago I saw this brutality masked as ‘cultural’ pretension in Spain and Portugal. Funny how the Brits get upset about animal slaughter but don’t have a care when human beings in foreign lands are killed. About 5000 people of been killed in drones attacks over the last five years and about 35% of those killed were women and children. Were the British exposed more to the bloodyness of death in events like bullfighting perhaps they would have more empathy when such outrages are unleashed on their fellow man. Hugh, you don’t speak for me. I get upset at killings in foreign lands too. Why do you make such foolish assumptions? In any event it’s not just “Brits” who are upset; the Spanish are turning against bullfighting too. B) Deny your ridiculous argument that failing to seek out and condemn every act of brutality on the planet renders one ineligible to condemn a particular act of brutality taking place before one’s eyes. C) Point out that it is not necessary to visit the corrida in order to qualify as a witness to the cruelty of bullfighting. Too often, it can appear unanticipated in films, television and other Spanish media. The Brits here generally don’t speak Spanish and therefore can’t join in to any social event, conversation or initiative, which is why they get so weird about animals here – they don’t talk back! Don’t we wonder what the Spanish think of us? Money, perhaps, but those silly shorts, the glow-in-the-dark pajama tops draped on their car-seats, our endless croon about ‘our furry friends’. Discover Spain, warts and all! If you don’t join in, then you can’t participate (true of everything, not just bullfights). 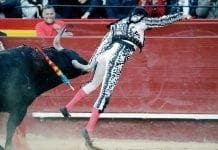 Most Spanish and foreigners participate in higher cultural forms than animal cruelty. You don’t need to speak any language in order to comprehend a barbaric act of torture. That’s true of any act of torture, not just bullfighting.